The exhibition "Russian Artists Abroad. Marianne Werefkin (1860-1938)"'opening at the Tretyakov Gallery, is a part of the Ticino Year in Russia - the year dedicated to the Swiss canton of Ticino in Russia - and is timed to coincide with the 150th anniversary of the artist's birth. Regrettably, the general public in Russia knows little about Marianne Werefkin, although she is a fascinating personality in many respects. Some viewers will be more interested in her evolution as an artist - from her "Peredvizhniki"-style realism, through symbolism and other schools that nearly all artists of her age engaged with, towards a very distinctive, idiosyncratic expressionism. Others will probably take an interest in her life story, so unusual for a 19th-century woman, including many dramatic turns of fate, and resolute decisions taken in the course of it. Marianne (Marianna) Werefkin was born on August 29 (September 9 according to the Gregorian calendar) 1860 in Tula, where her grandfather, Pyotr Daragan, the offspring of an old Cossack clan, was governor at that time (from 1850 to 1865). Marianne's grandmother, Anna Daragan (nee Balugyianskaya, 1806-1877) was a renowned author of children's books; her mother, Yelizaveta Werefkin (nee Daragan), was an amateur painter. Her father, General Vladimir Werefkin (1821-1896), distinguished himself in the Crimean and Russo-Turkish wars. Marianne started painting impulsively after falling ill at the age of 14, and her first pictures depicted visions resulting from her high body temperature. Her painting was encouraged by her mother, about whom Marianne later wrote more than once in her journals "Letters to an Unknown Man" (Lettres a un Inconnu)1. The family's moves between cities, connected to the father's military service, determined the path for the future artist to follow as an art student and a budding painter. She studied painting first in Moscow under Ivan Pryanishnikov, and afterwards in St. Petersburg in Ilya Repin's workshop (in 1887 Werefkin was appointed as commandant of the Peter and Paul Fortress). Repin had a very high opinion of his student, comparing her to Rembrandt and, perhaps to give a little encouragement, used to say that he envied her talent. Werefkin's pieces of that period bear the stamp of the "Peredvizhniki" (Wanderers) tradition of her teachers, and yet, in spite of Repin's support and obvious progress on the path to realist art, she was already beginning to search for her own artistic identity. Connected with this, her acquaintance with Western European art, which broadened her perspective, played a crucial role in the formation of her worldview. It is important to note Werefkin's ability to rejoice at other artists' success, and to genuinely admire their work: Werefkin's joy was so natural, so utterly devoid of envy, so sincere and free of the slightest affectation that the next turn in her life as an artist — her self-sacrifice to another painter's talent which she deemed much greater than hers — seems entirely natural. At Repin's workshop Werefkin met other artists at the beginning of their careers, in particular the military officer Alexei Jawlensky, four years her junior, who became her friend and partner for many years. Marianne became a social centre of a group consisting of Igor Grabar, Dmitry Kardovsky and many emerging artists from St. Petersburg. Often they gathered in the Werefkins' apartment at the Peter and Paul Fortress, where they studied prints of the new generation of Western European artists and discussed art. Igor Grabar later reminisced about these gatherings: "...Jawlensky introduced me to his big friend — Marianne Vladimirovna Werefkin, also an artist, Repin's student. 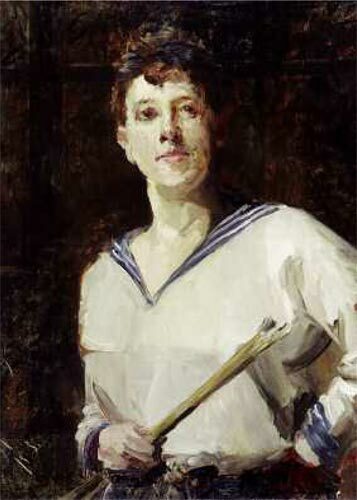 Her father was the commandant of the Peter and Paul Fortress, and the artists, including Repin, used to gather in their apartment at the fortress. With an excellent knowledge of foreign languages and financially comfortable, she bought all the newest books and magazines on art and acquainted us, who knew but little about all this, with the latest developments in art, reading to us aloud fragments from the most recent publications on art. There I heard for the first time such names as Edouard Manet, Claude Monet, Renoir, Degas, Whistler; Werefkin and Jawlensky then were especially fond of the latter — they saw his artwork on prints. "5 Werefkin's apartment at the fortress was visited by Konstantin Somov, Nicholas Roerich, Philip Malyavin, Osip Braz, Alexander Gaush, Anna Ostroumova and others. In 1893 Werefkin and Jawlensky set up their own studio in St.Petersburg, and after the death of Marianne's father in 1896, together with Grabar and Kardovsky moved to Munich, to continue studies at Anton Azbe's school. Werefkin and Jawlensky traveled across Europe extensively, studying new French painting as well as Renaissance art — in particular, in Italy, Fra Angelico and other "primitives", whom Werefkin admired. Their travel was financed by her father's 7,000-ruble pension, which Werefkin received after his death up until the time of the Bolshevik revolution. Another important aspect of that time was that Marianne Werefkin devoted herself almost entirely to fostering the talent of Alexei Jawlensky, in whose genius she wholeheartedly believed. It was a crucial moment in her life — so devoted to art and so keen on painting, for the first time she put herself in a position of humility, sacrificing herself in the way only a woman in love can. There may have been other reasons for her giving up painting for a while, like the attitude to woman painters prevailing in the late 19th century — even in Europe they were thought of as eccentric creatures. For nearly ten years, from 1896 until 1906, Werefkin did not work as an artist at all, with all her energies focused on nurturing the talent of Alexei Jawlensky. 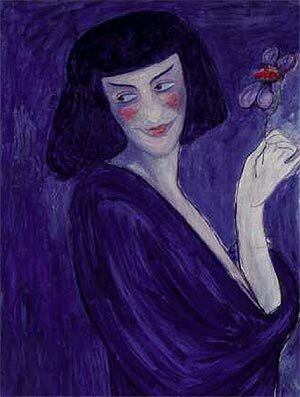 That period, when Werefkin completely blended into Jawlensky, brought her a bitter disappointment in him and in the platonic and elevated sentiments which, she believed, they shared equally. In 1901 it transpired that the chambermaid Lelya was pregnant, with Jawlensky the father. 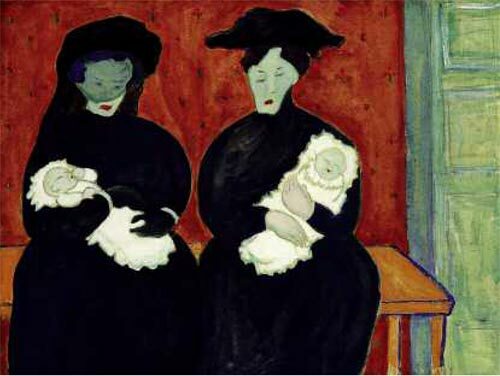 The baby was born in 1902 in Russia in a village and later on introduced to friends as Jawlensky's nephew. Werefkin felt betrayed, and most importantly, it turned out that the man to whom she sacrificed so much, including even her artistic individuality, did not share her views on love and the puritanical chastity of the relationship between men and women. Faced with this betrayal, in utter despair, Werefkin started a journal filled with outpourings of the heart, and with recitals of her aesthetic opinions and views on art and the artist's place in society, and on relationships between men and women. Begun in 1901 and finished in 1905, the journal includes three notebooks, each dated: I — 1901-1902; II — 1903-1904; III — 1904-1905. The confession in "Letters to an Unknown Man" helped Marianne forgive Jawlensky; they continued living together, and Werefkin continued to educate herself and Jawlensky. The decade of "artistic silence", the resolution of the artist whose talent was so much appreciated by her teachers to abstain from painting, did not pass without yielding fruits. These years were spent not only nurturing the talent of Alexei Jawlensky, whom she adored, but also searching for her own identity, molding her own character. Werefkin not simply became the muse of an artist — she became the heart and soul of an artistic experiment fermenting in the international community of artists in Munich at the turn of the 20th century. 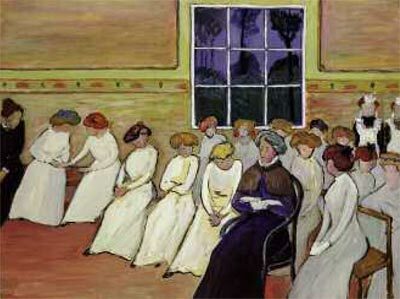 Their discussions on art, of which Werefkin was one of main originators, undoubtedly benefited every member of the "Brotherhood of St. Luke" (the "Lukasbruder"), which she founded in Munich in 1897, as well as members of the "New Association of Artists in Munich" ("Neue Kunstlervereinigung Miinchen") that was created on Werefkin's initiative in 1909 and headed by Wassily Kandinsky. In 1906, after a ten-year pause, the 46-six-year old Werefkin once again took a brush in her hands, but now she was a completely different sort of artist. Everything changed in her art: from the technique — she now used only distemper — to the style reflecting the daring and the innovative tendencies of symbolism, fau-vism and cloisonnism, which attracted her so strongly in the French masters' art. In 1903-1905 Werefkin and Jawlensky travelled in France: it was a very important visit for both — their itinerary included not only Paris, but also Normandy, Brittany, and Provence, the most significant hubs of creativity of the time. Jawlensky even took part in the activities of the Russian section (organized by Sergei Diaghilev) at the Autumn Salon (Salon d'Automne) in 1905. That Salon exhibition for the first time extensively featured fauvists — Henri Matisse and Andre Derain — who, along with Vincent Van Gogh and Paul Gauguin, influenced both Werefkin and Jawlensky. After this travel Werefkin again returned to work. In the mid-1900s in Munich she and Jawlensky became close with Wassily Kandinsky, Paul Klee, Franz Marc, and Gabriele Munter — all these artists became members of the "New Association of Artists in Munich". 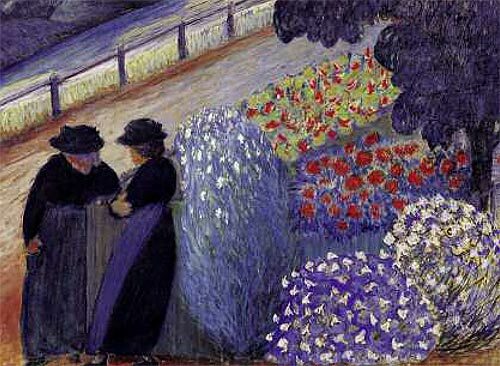 In 1909 Werefkin together with Kandinsky, Munter and Jawlensky summered in Murnau, in Gabriele Munter's house. However, soon these two artistic couples parted ways, and Werefkin and Jawlensky did not make the step towards abstraction that later brought fame to Kandinsky. However, it was Marianne Werefkin who was called by a critic "a midwife of abstraction", meaning that the conversations and arguments about the new directions in art among these artists led to the birth of the new language, including Kandinsky's lyrical abstraction. Later, although Werefkin and Jawlensky did not join the "Blue Rider" (Blaue Reiter) society founded by Kandinsky, they participated in its shows. An Expressionist poet Else Lasker-Schule in 1913 gave to Marianne yet another honorary title, 'Amazon of the Blue Rider"9. Marianne Werefkin and Alexei Jaw-lensky, strictly speaking, were not emigres. When they left for Munich to continue their studies, they never severed ties with Russia: before World War I they spent long periods of time in the Russian Empire — in the Blagodat estate in Kovno in Lithuania, where Pyotr Verevkin, Marianne's brother, was governor. They were part of both the European and Russian art scene: they showed works at the exhibitions of the "Berliner Secession", "Der Sturm" and "Blue Rider" in Germany and the "Jack of Diamonds" in Russia. This artistic couple had an amazing, even extraordinary relationship. In "Letters to an Unknown Man" Werefkin often talks about the essence of love which, according to her deeply held belief, cannot have anything in common with the animal coupling of human bodies. Werefkin's love for Jawlensky, while reserving an autonomous terrain for herself, was sacrificial. Shortly before the start of World War I Werefkin, pained over new complications in her relations with Jawlensky — indirect references to this can be found in her exchange of letters with Igor Grabar — lived in Russia, a guest of her elder brother Pyotr in Kovno. 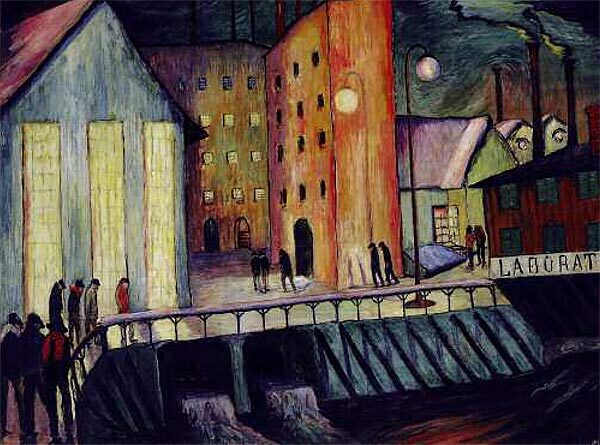 Jawlensky was preparing to participate in the famous Russian exhibition in Malmo in Sweden10. 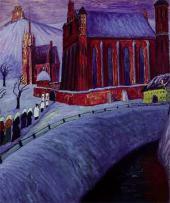 In August 1914 both artists returned to Munich, from which they were forced to move to Switzerland after war broke out. Paintings by their friends and teachers — Van Gogh, Gauguin, Kandinsky and others — were left unattended in their flat in Munich. 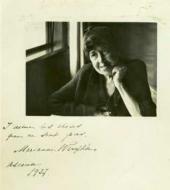 In Switzerland, Marianne, Alexei, his son and the son's mother Yelena Neznakomova first settled in Saint-Preux near Lausanne, and in 1917 in Zurich, where they visited the Dadaist Cabaret Voltaire; Werefkin had her first opportunity to work for theatre — in Lugano she cooperated on a ballet production with the Russian ballet dancer Alexander Sakharoff. In 1919 they settled in Ascona, a small town in the south of Switzerland, near Lago Maggiore, on the border of Switzerland and Italy. The local climate, warmer than in the north of Switzerland, suited Jawlensky better. Switzerland became for Werefkin her last refuge. 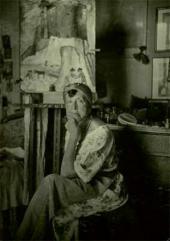 In 1921 she and Jawlensky broke up forever. She wrote about it in her journal: ".. .he is the creation of my life, my ultimate goal, my torture"11. Jawlensky finally decided to marry his son's mother, Werefkin's former maid Yelena Neznakomova and moved with her and their 20-year-old son from Ascona to Wiesbaden. In spite of the deepest crisis in her life and a feeling of complete loneliness at 61, Werefkin not only continued to live and work but also set in motion artistic currents around herself, even in a town so small as Ascona. 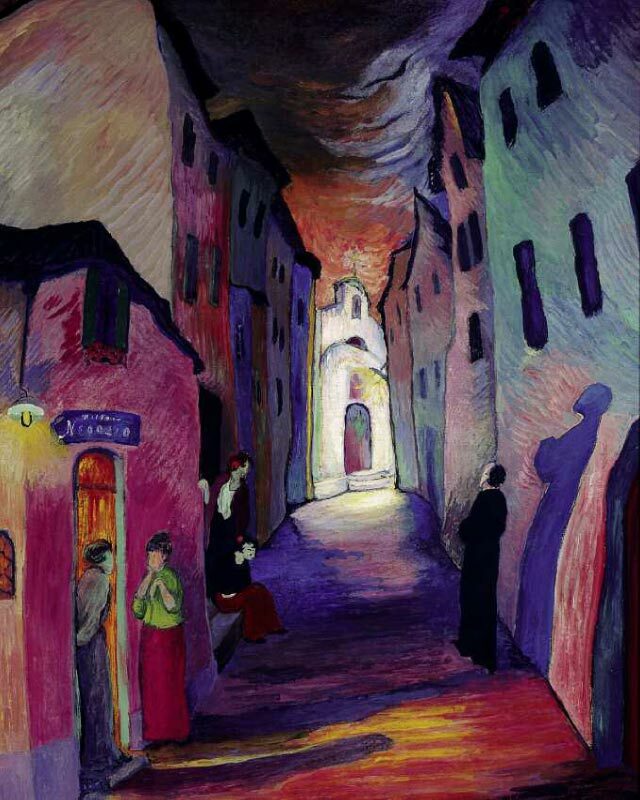 In 1924 Werefkin became one of the founders of an artists' association in Ascona "Great Bear" (GroBe Bar), open to artists who lived in or often visited the city. And in 1922 Werefkin together with the Swiss artist Ernst Kempter organized in the small and provincial Ascona a small museum of modern art. Making use of her connections, she asked painters she knew to gift to the museum one work each. Thus, she repeated the experience of Alexei Bogolyubov, who organized in Saratov the Radishchev museum, but unlike her predecessor she never had any support from powerful institutions or highly-placed persons. The first show of the future museum took place in Ascona, at the Villa Pancaldi, now home to the museum. Today paintings gifted by Alexei Jawlensky, Paul Klee and other famous artists, together with the world's largest collection of Werefkin's works as well as pieces by Richard and Uli Seewald, form the basis of the collection of the Museum of Modern Art in Ascona. Marianne's last years were clouded with illness and poverty. She was no longer receiving her father's pension, and she sold her paintings only rarely, to people able to appreciate them. Yet, that period in her life was not without a stroke of luck: in the late 1920s Werefkin met Carmen and Diego Hagmann, who started collecting her works and supported the artist when she could no longer work. Werefkin's friends in 1937 managed to take out of Munich the pictures she had created there before World War I and so saved them from destruction, since her artwork was put on the so-called "degenerate art" list. When Marianne Werefkin died in Ascona in 1938, her funeral, held according to Christian Orthodox tradition, drew crowds of local residents, for whom she had done so much and who repaid her in kind with loyalty and lasting memory to this day preserved at the Marianne Werefkin Fund (Fondazione Marianne Werefkin) and the Museum of Modern Art in Ascona, as well as in many of Ascona's families in possession of the Russian artist's works. Unfortunately, not a single large Russian museum today owns Werefkin's artwork, and only private collectors hold individual pieces. However, interest in this figure at the centre of the cardinal changes in Russian and European art at the turn of the 20th century is growing, and recently art scholars in Russia started to focus on Werefkin too. Most of the paintings she created late in life — from the time when she returned to painting — and dozens of drawing-books with sketches, as well as the manuscript of "Letters to an Unknown Man", are held in Ascona at the Marianne Werefkin Fund and the Museum of Modern Art. The rest of the artist's legacy is scattered across such European museums as the Villa Stuck in Munich, Museum Wiesbaden, SchloBmuseum Murnau and others. A distinctive, dramatic vision of the world, the bright, rich colours entirely unrelated to objects or lighting, a somber or, in contrast, a highly intense general colouring are characteristic of Werefkin's art. Although she spent 30 years by Jawlensky's side, and several years by Kandinsky's, her manner is idiosyncratic. Her later works (starting from 1906) are made with distemper; nearly all of them are of a small size, and the artistic temperament they are injected with make them hard to confuse with other artists' works. 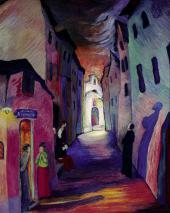 One of the main motifs of Werefkin's art of the 1900s-1930s is that of the road. Her 1907 piece "Autumn. 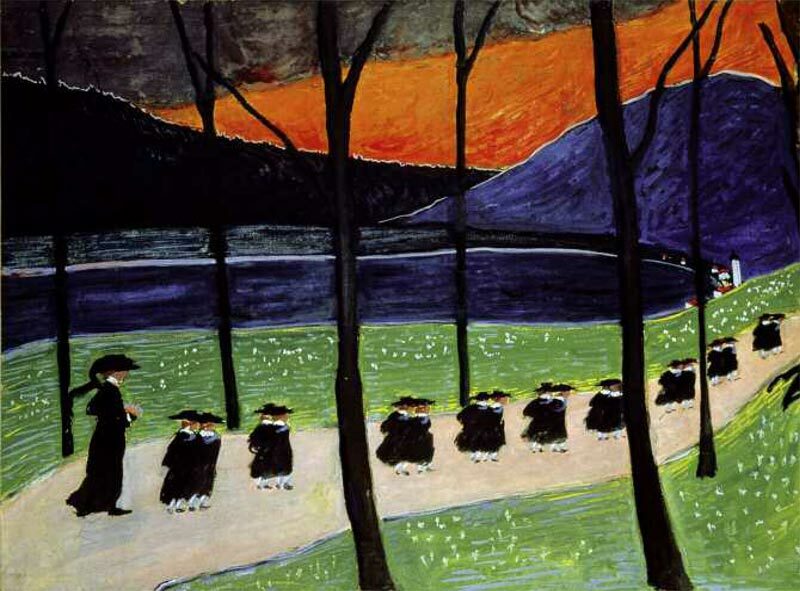 School" (Marianne Werefkin Fund, Ascona) depicts schoolgirls filing along a road in pairs, in a calm and measured fashion, under a teacher's supervision. All wear similar little black dresses and hats. The image would have looked cheerful had it not been for the potent and jarring combination of orange, black, grey and dark-blue in the scenery, and the naked black tree trunks that split the image, making the girls look as if they are in cages and arresting their movement. The blue "Country Road", also created in 1907 (Marianne Werefkin Fund, Ascona), looks frighteningly deserted. The road rises nearly vertically from the picture's forefront to the background and, rather than terminating, simply blends into the valley. In the foreground are three tersely imaged figures of old women in white kerchiefs12 who look in this simple but horrifying setting like characters from a fairy-tale. 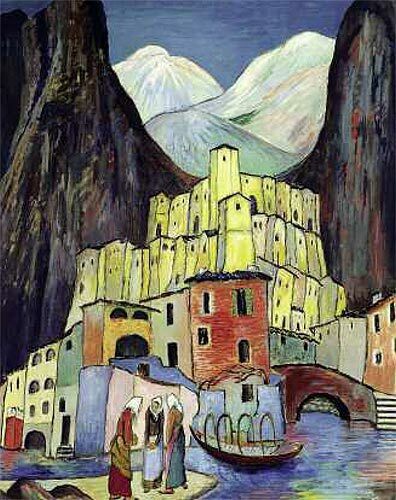 Similar looking old women in white kerchiefs — Werefkin probably saw them once in Lithuania — figure in one of her 1930s paintings "City of Mourning" (Marianne Werefkin Fund, Ascona), where she links these old women to a Swiss alpine setting and the city which residents of Ascona easily recognize as their own. The sharp diagonal of the yellow road cuts in two a red field in the painting "Tragic Atmosphere" (1910, Museum of Modern Art, Ascona). Red is charged with this feeling of the irremediability of what is happening, and the road can be likened to a spring unwound. 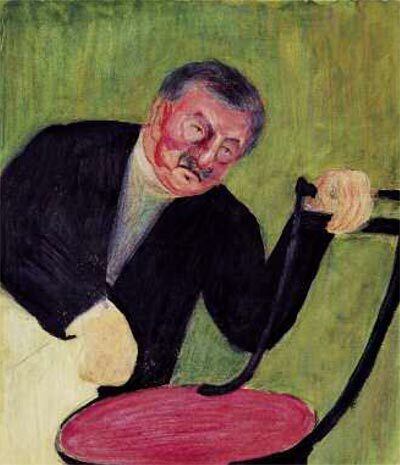 Undoubtedly, this painting, like many others of Werefkin's works, was an immediate reflection of the tensions in her relationship with Jawlensky. "Whirl of Love" (heritage of Carmen and Diego Haggman's collection, Zurich), created around 1917, when, one would think, everything was in the past, shows how important a place he occupied in her life. Besides the theme of the road, Werefkin used other motifs as well, including the multiplication of figures in similar poses ("Autumn. School", "Womens' Boarding House", "Skating Rink", "Industrial City. Return Home", "Mine" — presently all at the Marianne Werefkin Fund in Ascona), electric light ("Skating Rink", "Arrival of Night", "Ave Maria" — all at the Marianne Werefkin Fund in Ascona), boats on a lake ("Ship of Fools", "Full Moon", "Fishermen in a Storm" — all at the Marianne Werefkin Fund in Ascona). But in every image these motifs have a slightly different turn, which, on the one hand, makes the artist's manner recognizable, and on the other, enables her to translate her own emotions into painting. Yet it seems that the analytical spotlight ought to be directed not so much on her artwork as on her exceptional personality, her views of art and morality, her life itself, which can serve as an example of personal integrity and selfless devotion to art and the supreme, spiritual love. The artist's inner world with which she communicated through her journal is her creation in the same measure as her paintings and graphics. In "Letters to an Unknown Man" she talks time and again about "my 'self" (in French, in which the journal is written, this sounds more beautiful — "mon moi"). This is her soul molded by much suffering and many a loss, the soul of a woman and an artist. This journal is kept at the Marianne Werefkin Fund in Ascona. They were published in French in 1999 with commentary and foreword by Gabrielle Dufour-Kowalska: Werefkin, Marianne. Lettres a un inconnu: Aux sources de l'expressionnisme. Pr sentation par Gabrielle Dufour-Kowalska. Klincksieck, 1999. Marianne Werefkin's letters to Igor Grabar are held at the Department of Manuscripts of the State Tretyakov Gallery ( Igor Grabar fund); they have been published for the first time in the catalogue of the Werefkin exhibition at the Tretyakov Gallery - Ascona, 2010. [The author's acknowledgements to Yelena Terkel for her contribution to this publication]. In Berlin Werefkin's attention was captured by a portrait of the soldier of fortune Alessandro del Borro, then attributed to Diego Velazquez, and later to an unknown master. Department of Manuscripts of the State Tretyakov Gallery, Fund 106. Item 3242. Grabar, Igor. Moya Zhizn [My Life]. Monograph About Self. Moscow, 2001. P 96. The two maids are a woman cook named Pasha and a sixteen-year-old chambermaid named Lelya - Yelena Neznakomova, who was to play in Werefkin's life quite an unsavory role. Quote from Werefkin's letter to Grabar: Department of Manuscripts of the State Tretyakov Gallery, Fund 106. Item 3245. Werefkin, Marianne. Lettres a un inconnu: Aux sources de l'expressionnisme. Presentation par Gabrielle Dufour-Kowalska. Klincksieck, 1999. Pp. 75-77 (notebook I, pp. 29-30). Werefkin, Marianne. Lettres a un Inconnu: Aux sources de l'expressionnisme. Presentation par Gabrielle Dufour-Kowalska. Klincksieck, 1999. P 156 (notebook III, p. 120). 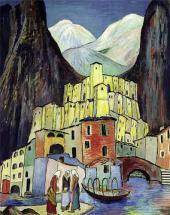 This information is provided in the catalogue of the exhibition in Rome, 2009: Marianne Werefkin (Tula 1860 - Ascona 1938). Lamazzone dell'avanguardia. Alias, 2009. PI 113. The exposition was opened in 1914 in Malmo (Sweden),but soon war broke out and all of the exhibits were "under arrest'.' Some of them returned to Russia many decades later (Kuzma Petrov-Vodkin's "Bathing of the Red Horse"), others remained in Sweden for good. See: Tolstoy Andrei "Exhibition in Malmo -1914". Soviet painting-5. Moscow: Sovetsky khudozhnik [Soviet artist], 1982. Pp. 215-222. Werefkin, Marianne. Lettres a un Inconnu: Aux sources de l'expres-sionnisme. Presentation par Gabrielle Dufour-Kowalska. Klincksieck, 1999. P 107 (notebook II, p.10). 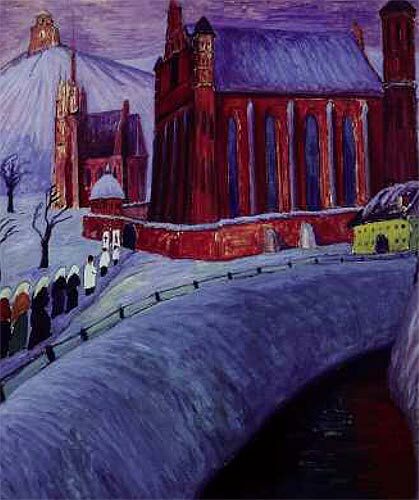 Similar figures are featured in the "St.Anne's Church in Vilnius"1913 (Marianne Werefkin Fund, Ascona), which suggests that the "Country Road" too was created in Lithuania. Werefkin, Marianne. Lettres a un inconnu: Aux sources de l'expressionnisme. Presentation par Gabrielle Dufour-Kowalska. Klincksieck, 1999. P 101 (notebook I, p. 234). Werefkin, Marianne. Lettres a un inconnu: Aux sources de l'expressionnisme. Presentation par Gabrielle Dufour-Kowalska. Klincksieck, 1999. P 106 (notebook II, p.8). Tempera on paper mounted on cardboard. 21 × 29 cm. Carmen and Diego Hagmann’s collection, Zurich.